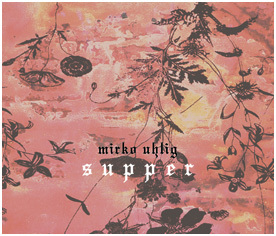 Mirko Uhlig's "Supper" has a fascinating backstory, but in the end, it's all about the timbre, resonance and vibration of one track, "My Child Goes To the Surf (2nd)". Uhlig is a true explorer, questing to find new continents of sound. Sometimes he merely discovers islands, but these too are rich and exotic. Thus the five other tracks off the coast of "My Child...". They are enigmas, opening acts, sketches, deliberate false starts, and a closing track, "Old Clouds", that has a calming, centering effect. Attached is a seventh, unmentioned track which breaks with all that precedes it – an "old acoustic guitar" and a "battered accordion" engaged in a spirited pastoral conversation. You can hear lambs baa-ing in the background. Perhaps mutton is what's for supper. What it's mainly about, then, purely aethetically, is the massive, twenty-three-minute long third track. Uhlig works up to it with the "1st"” part of "My Child Goes To the Surf", in which the drone sneaks up as a backdrop to a series of small concrete gestures, literally getting bonked on the head before making the transition onto the ambient plateau. And then Uhlig uncoils the almost Platonically perfect drone. According to a tribute written by his colleague Tobias Fischer, this album is his very idiosyncratic tribute to Genesis' "Supper's Ready", an extended and so very English suite taking up much of the second side of their album "Foxtrot" (1972), which profoundly affected him when he first heard it as a kid in the early nineties. But unless the paean to childhood is meant as a subtle subtext, it fails to manifest itself for the uninitiated. It is comprised of simple elements, as is appropriate. Two notes contributed by his friend Marcus Obst (Dronæment) are looped and cast into the emptiness accompanied by a gradually building amount of vinyl crackle sampled off the lead-out groove of Uhlig's own copy of "Foxtrot". It's that simple and it's gorgeous. It is certainly not unique, it has certainly been committed to disc before with great success by other artists, but there is some indefinable element – maybe it is an absence hanging in the air – that makes Uhlig's particularly memorable.